Jacks ‘R’ Better, LLC is a cottage outdoor gear manufacturer. We produce high quality quilts, hammocks, tarps, and other gear. All JRB are proudly Made in the USA. Our gear is extremely popular with ultra-light backpackers, thru-hikers and campers in general. All Jacks ‘R’ Better, LLC products carry a satisfaction guarantee and a one-year warranty on material and craftsmanship. We enjoy great reputation for unique, top quality products at super value and excellent customer service. The many reviews of our quilts and tarp bear witness to our leadership and value. Over a decade ago I (Don) had the pleasure of meeting The Jacks at a hammock hang, a few months later we did our first of many AT section hikes together. The Jack’s have become friends, mentors and family to me. Years prior to meeting The Jacks I met Dave at a Viking funereal for a goldfish (true story), we quickly became friends and each other’s bad influence. When the Jacks decided to move on to new adventures and offered us the opportunity to leave our old careers and do something we are passionate about we jumped at the chance! It is an honor to be the next part of the Jacks R Better story! We look forward to providing great customers service, fast shipping, quality products and a few new surprises in the coming months. We design and manufacture quality products using quality materials and craftsmanship. Same or next day shipping is our standard. If we cannot ship it immediately it is not for sale on our website. We take pride in our products and our customer service. If for any reason you are dissatisfied, let us know and we will make every effort to remedy the situation. Jack Tier (left) & Jack Myers (right) are retired Army officers with a combined 50 years of active duty military service. 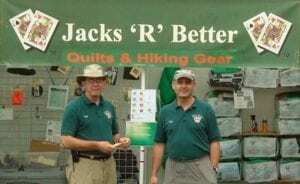 They began hiking together in 2002, started making some of their own gear, and formed Jacks ‘R’ Better, LLC in 2004.